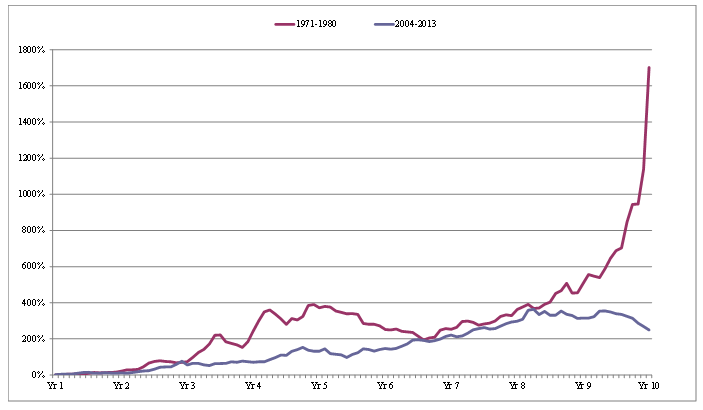 Are Gold Stocks Good Long Term Investments? Today, many mainstream financial pundits fail to see gold and silver mining stocks as viable investments. Inappropriately, they blindly compare gold stock returns with various broad stock index returns since 2008 which leads to erroneous conclusions. But others disagree. WindRock recently moderated a panel discussion which featured Peter Schiff, Doug Casey, and Adrian Day on the appropriate role and opportunity gold and silver mining stocks represent. Where the price of gold is eventually headed. Gold Stocks Have Doubled, but Is This Only the Beginning? WindRock interviews Adrian Day, British-born writer and money manager. In addition to acting as president of Adrian Day Asset Management, Mr. Day manages EuroPac Gold Fund, the top-performing gold fund in first half of 2016. As an expert in precious metals and gold stocks, Mr. Day discusses the following: why investors should consider a gold allocation in their investment portfolio; what investors should consider before investing in gold; what has driven gold's substantial appreciation in 2016; which factors cause gold stocks to outperform physical gold when the gold price increases; and what economic and financial events and trends suggest gold should continue to appreciate.. July 2016. Anthem Vault, a precious metals broker and custodian, interviews Brett Rentmeester, President of WindRock Wealth Management. Mr. Rentmeester addresses such topics as: reasons mainstream financial advisors fail to see the opportunity with owning gold; economic scenarios in which gold investments should appreciate significantly; gold's role and purpose within an investment portfolio; and problems and recent developments within the wealth management industry. May 2015. Part III of the V Part Series,Why Gold? Gold serves a unique role in investment portfolios, not only as insurance against extreme events, but as a timeless store of value in a world of multiplying paper currency. Why own gold? In simple terms, gold has been a store of value for thousands of years because it has retained its purchasing power while “fiat” currencies, which are promises unbacked by precious metals, have eventually been overprinted and seen their value diminish or completely disappear. Gold is a currency that has no liabilities, is outside of the fragile global banking system, and cannot be printed out of thin air like other currencies. Gold is a particularly important asset to own when money is being printed as carelessly as it is today. Policy actions today heavily increase the odds of more extreme events in the future that should be keeping all investors up at night. Many investors view gold as “insurance” against extreme scenarios, which we address below. 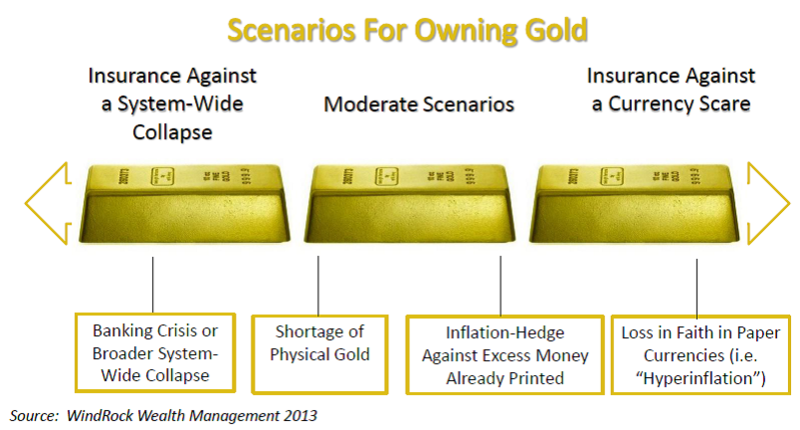 While true, they miss the multiple scenarios for owning gold, not all of which involve an extreme outcome to recommend it as a key holding. Banking Crisis or System-Wide Collapse – Is a renewed banking crisis a valid concern to worry about today? Absolutely. The world was on the verge of the largest global banking collapse in modern history in 2008. Trillions of dollars were printed to paper over the problems, but the central issues still remain. At the center is the fact that modern-day banks act more like highly leveraged hedge funds than traditional lenders. With financial derivatives nearing 10 times global gross domestic product (i.e. GDP), the global banking system remains highly leveraged and susceptible to any spark that could ripple through the system. A new worry has emerged for savers as the recent “bail-in” in Cyprus led to the seizure of nearly 50% of deposits held by savers over €100,000. Many other countries are working on legislation that may allow for future bail-ins as well (including the Europe Union, Canada and the U.S.). With this risk in mind, the idea of holding cash at a bank where it earns 0% and could someday be seized makes gold held outside of the banking system an increasingly attractive alternative for concerned savers. As the entire developed world continues to print money to manipulate markets higher in the absence of healthy organic growth, the risks of a systematic global banking crisis continue to rise. However, we believe that policy makers looked over the cliff of a global banking crisis in 2008 and decided they would print as much money as necessary to avoid that fate. Thus, events moving us closer to a banking crisis actually increase the odds for the opposite outcome – that policy makers print even more money, aiding the banks, but panicking investors about inflation. Central banks have one potential “ace in their pocket” if we see renewed banking scares, but it is not a card they want to play. If a banking crisis lies ahead, policy makers will be desperate to do whatever they can to restore faith in the system. If the printing of money fails to deliver stability, then the reinsertion of gold into the currency system could be their Plan B. Napoleon successfully reinserted gold into the failing currency system during the French Revolution to restore faith. He stated “while I live I will never resort to irredeemable paper.” In our opinion, policy makers would only take this action in a worst-case scenario where they have lost control of the system. As we discussed in our earlier pieces, re-backing the dollar with gold (as an example) at ratios similar to the 1930s could propel gold upwards of $8,000 per ounce. Money is no more than a medium of exchange. Only when it has a value acknowledged by more than one person can it be so used. The more general the acknowledgement, the more useful it is. Once no one acknowledged it, the Germans learnt, their paper money had no value or use. Investors today must recognize that we are conducting the largest monetary experiment in modern history with unknown consequences. We are not suggesting that these extreme scenarios are likely outcomes. However, we are suggesting that, in today’s uncertain world dominated by money printing and government manipulation, these scenarios require a serious level of understanding. Despite shielding their views from the investment public at large, our experience suggests the smartest investment minds speak of these fears behind closed doors. Shortage of Physical Gold -- There is compelling evidence suggesting that there is not enough physical gold relative to the amount of paper contracts written on it today. Some reports suggest that as many as 100 contracts of paper gold exist for every one bar of physical gold. To benefit from this, investors do not need an extreme outcome to see the value of gold unlocked, but they do need to own the actual physical metal. Many investors think they own gold, but what they actually own are paper contracts with no ability to receive the actual physical gold. Recent actions by global banks such as ABN AMRO are early warnings that cracks may be developing in the gold market. They defaulted on delivering physical gold to clients who owned it (instead redeeming them in cash). These paper claims dwarf the amount of physical gold that can be found at today’s prices. Paper claims include most precious metals mutual funds and exchange traded funds (“ETFs”) and gold held in “unallocated” bank accounts (i.e. those not held in the legal title of the account holder, but commingled with other investors on the balance sheet of a financial institution). Prospectuses of most ETFs allow redemption in cash to investors. Thus, this could result in an investor being redeemed out of their gold holding at an inopportune time well before gold reaches its peak value. The gold market mimics the fractional-reserve banking system in that a small amount of physical gold underlies many paper claims. As more investors realize this, there could be a scramble to secure the actual physical gold, driving prices up significantly. Under these conditions, we’d expect a wide premium to develop benefitting physical gold over paper claims on gold that can’t deliver the underlying metal. Compounding matters is the fact that gold is commonly leased out by central banks around the world. This makes it hard to accurately analyze who actually owns the gold as messy international accounting rules allow more than one party to claim the same gold on their respective balance sheets. Leading investment minds, such as Eric Sprott of Sprott Asset Management, have extensively investigated this issue, posing the question, “do western central banks have any gold left?” We believe there is much less physical gold available than meets the eye – at least at today’s prices. The physical shortage will accelerate as more investors include precious metals as a component of their portfolios. In addition to investor demand, governments around the world continue to increase their holdings of gold, especially countries like China where gold represents only a small portion of their reserves today. For those that doubt the viability of gold as an asset, it is instructive to see what the governments of countries bailing out other weaker countries generally require for collateral – a country’s gold! There is also a camp of thought suggesting there could even be a hidden game underway today, orchestrated by policy makers. 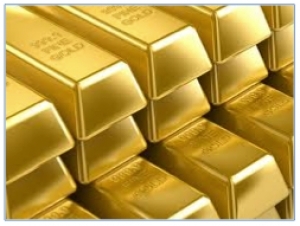 Central banks may be active in suppressing the price of gold in the paper derivatives markets as they quietly accumulate physical gold on the cheap. Some believe that once they own the majority of physical metal on their balance sheets, they will cease these actions and gold will be revalued suddenly, perhaps over a weekend. This would suddenly give them a valuable asset to offset many of their liabilities. If this is true, the problem is that too few investors will be holding any physical gold at the time to benefit. Hedge Against Inflation – Without having to assume any type of extreme scenario, gold will be a good investment if the world keeps printing money to try and solve its problems. We believe they will keep printing as the lessor of evils. Printing money will lead to a decline in the value of currencies versus gold, stoking inflation as devalued currencies buy fewer goods. 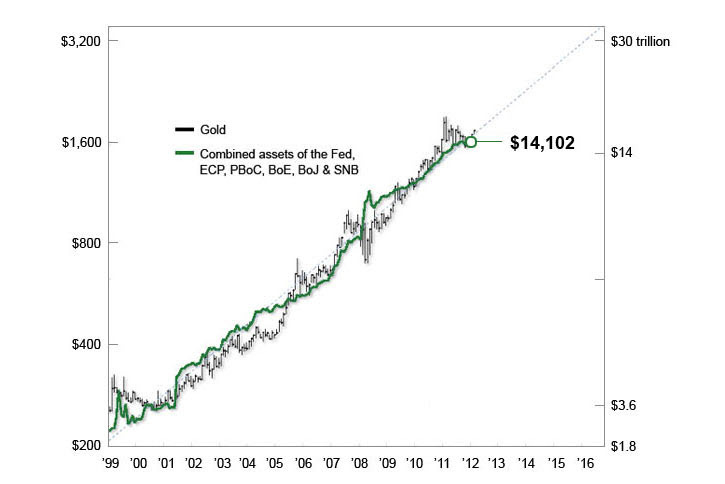 This is the number one reason to own gold – as a hedge against central bank risk and the overprinting of money. We believe that irrespective of money printing ahead, the reckless printing since 2008 already makes currency devaluation versus gold a high probability event. Historical data suggests that inflation often follows money supply growth, but with a lag. Since 2008, we have increased the money supply upwards of 260% in the US. In addition, we are currently printing approximately $1 trillion dollars a year as our long-term liabilities continue to grow out of control. To us, this suggests a high risk of inflation ahead at a time when inflation-protected investments are very cheap and unloved by investors. In closing, gold is not a one-trick pony. Own gold for the likely moderate scenarios, but rest assured that gold is the best asset if we get pushed to the extremes. All content within this article is for information purposes only. Opinions expressed herein are solely those of WindRock Wealth Management LLC and our editorial staff. Material presented is believed to be from reliable sources; however, we make no representations as to its accuracy or completeness. All information and ideas should be discussed in detail with your individual adviser prior to implementation. “A Hedge Fund Economy” WindRock Wealth Management. Web. August 2013. White, Andrew Dickson. Fiat Money Inflation in France (New York, NY: D. Appleton Century Company 1933), p. 77. Murenbeeld, Martin. 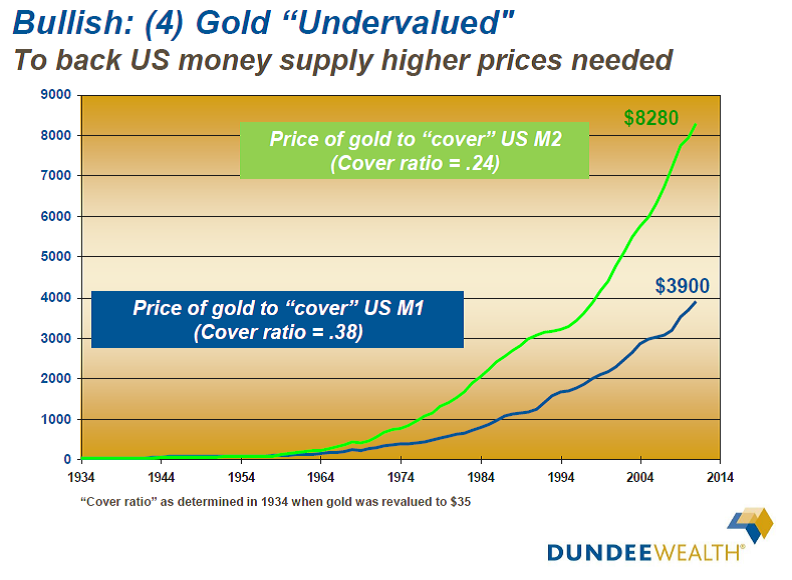 “Gold Monitor” DundeeWealth Inc. Web. 5 April 2013. Kruger, Daniel and McCormick, Liz Capo. “Treasury Scarcity to Grow as Fed Buys 90% of New Bonds.” Bloomberg. Web. 12 December 2012. <http://www.bloomberg.com/news/2012-12-03/treasury-scarcity-to-grow-as-fed-buys-90-of-new-bonds.html>. Rothbard, Murray. A History of Money and Banking in the United States (Auburn, Alabama: Ludwig von Mises Institute, 2002), pgs. 59-60. Naylor-Leyland, Ned. Cheviot Asset Management. Interview with CNBC Europe. Web. 23 December 2011. <http://www.cheviot.co.uk/media/press/outlook-gold-2012>. “Largest Dutch Bank Defaults on Physical Gold Deliveries to Customers.” Clarity Digital Group LLC d/b/a Examiner.com. Web. 3 April 2013. 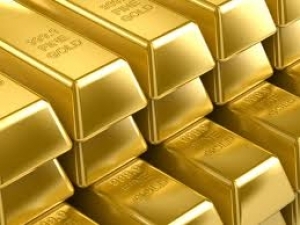 <http://www.examiner.com/article/largest-dutch-bank-defaults-on-physical-gold-deliveries-to-customers>. Casey, Christopher. “Inflation: Why, When, and How Much” WindRock Wealth Management. Web. July 2013. < http://windrockwealth.com/inflation-why-when-how-much>. Part II of the V Part Series,Why Gold? The value of gold is hard for many to grasp. Critics point to its lack of cash flow and argue it is impossible to value. Others say its value is a sort of greater fool's theory where it only has value to the extent someone will buy it at a higher price. However, these arguments completely ignore the scarcity of gold. In fact, all the gold ever mined throughout history can fit into two Olympic-size swimming pools. Second, some level of understanding of human psychology is required to comprehend gold, a skill largely absent from the armies of investment intellects today. There are many items that people assign value to that could otherwise be junk at a garage sale to an unknowing seller - a Babe Ruth baseball card, the Mona Lisa painting, or even the Hope diamond. However, no one would be so foolish as to argue that these items do not represent true value simply because they lack cash flow and need another buyer who appreciates their value. In fact, paper currency itself is only valuable because people believe in its value. What is a $100 bill really? As the Austrian school of economics established, all value is subjective. Gold has value because it is scarce, is valued for its beauty, and most importantly - has been viewed as money throughout history. Given its increase in value during the last decade, some critics have suggested that gold is in a "bubble" – a sort of psychological ascent where price becomes disconnected from reality. We would suggest they have it completely backwards. It is the amount of paper money being printed that is the bubble. Gold is simply stable purchasing power. While giving the appearance of rising, gold has actually stayed stable while paper currencies have depreciated against it. The more they depreciate, the more it appears as if gold is rising. In our minds, there is one simple measure to value the price of gold – its quantity relative to the amount of paper money in the system. The more paper money in the system, the more gold will be worth. As illustrated below, the ascent of gold has mirrored the growth of paper money on central bank balance sheets. Another way to think of the value of gold is to ask what its value might be if it was used again in the official monetary system. If we returned to a gold-standard backing of the US dollar similar to the levels of the 1930s, gold could exceed $8,000 per ounce under certain conditions. When viewed in the context of the rise in gold in the 1970s, today's increase looks fairly mild with much more potential upside if we followed a similar pattern. With the amount of paper money in the system multiplying at dangerous levels, we believe the value of gold is poised to rise in the years ahead. In our view, policy makers will continue to print money and knowingly risk inflation as the lessor of evil strategy versus the alternative of presiding over a crash of our overleveraged system. This means higher prices for precious metals and other hard assets that cannot be printed from thin air. However, this will not be a straight path. Expect volatility as continued economic weakness prompts occasional deflation fears that give pause to gold's rise. However, we fully expect periods of sustained economic weakness to be met with even more aggressive money printing, which will lift gold higher. Gold experienced almost a 50% correction in the 1970's (December 1974 through August 1976) before rising over 700% (January 1980). During these periods, investors need to resist being shaken out of their positions and should increase exposure during any sustained weakness. Our diagnosis of inflation is secular and one we expect to persist for years ahead. Timmer, Jurrien. "Boxing Match: Central Banks vs. the Economy". Fidelity Viewpoints.(https://www.fidelity.com/viewpoints/market-and-economic-insights/timmer-september-market-commentary). September 16, 2012.